1:55 Good night Wolf and Rage and all who follow. Hi, Anne! Nope over on this side of the pond, it's morning of Thursday! Welcome to the earlier arrivals! What an exotic flower. To get the reward it's a straight forward solve 2-9, then 1. Enjoy your day and make someone happy along the way! It was sunny when I went to class, but now it isn't. Hope your day gets mine that left! Sorry, I guess the name has nothing to do with that kind of passion! I did a watercolor of a Passion Flower a few years ago. It turned out quite well. I gave it to a friend - always intending to paint another, but still haven't. They are such intriguing flowers to paint. Late getting here this morning, but I can still say good morning. And I'm just in time to go for it. How could I not also claim a CP? We had a passionflower in our yard when I was a little kid. I remember my dad explaining the symbolism of the flower parts. It was probably the first time that I focused on the different parts of a flower. What a gorgeous flower! for the photo, Wendy. 2:19. Good afternoon from Newark. Morning all,my first thought was,that is the flower of the passionfruit vine,hadn't seen one that colour before. Today is grandparents day at Ella and Cailin's school. One set of grandparents live on the other side of the country and the others are both working so we the great grandparents are going to be there for them. all. It's quite cold here today with a blustery north wind. 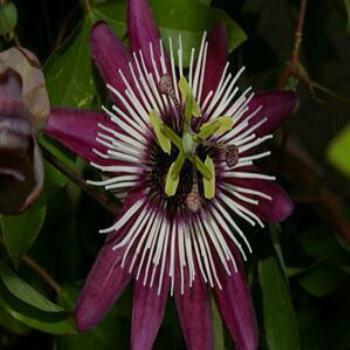 When we lived in Barbados, we had a passion fruit vine that had flowers a similar colour to this one. The fruit made the most wonderful juice! I read somewhere that there are about 500 different species of passion vines. With all the discussion re. today's Passion Flower & now that I have a moment, I searched for more photos... WOW - they surely are intricate! A side view shows all those parts you were talking about, Keith; ranging in size from 1/2 inch to 6 inches across - I still say WOW! Wow.. perfect passion flower.. nice to see such beauty thanks for sharing ... we may have first snowfall tonight... Enjoy your day and warm weather..